Table of Contents I. Annual Service Enhancements 201601. Overview02. The Process03. 2016 ASE Public Information Meeting Dates and Times04. Route AssessmentsII. Per Route Maps and Change Narratives05. 2016 Route 4 Levy/Amboy06. 2016 Route 8 Rodney Parham07. 2016 Route 16 UA Little Rock08. 2016 Route 18 McAlmont09. 2016 Routes 12, 20 and 2110. 2016 Routes 9 and 1411. 2016 Routes 17, 22 and 2312. 2016 Routes 15 and 1113. 2016 Routes 6 and 2614. 2016 METRO Streetcar Enhancements15. 2016 Stop Enhancements16. 2016 Fare Enhancements17. 2016 METRO Links Paratransit Service EnhancementsIII. Ways to Stay in Touch with Us18. Connect with Us! As part of an annual review process, Rock Region METRO planned and implemented several 2016 system service enhancements, including changes for 16 of its 26 bus routes. A fare review, the first since 2009, was completed as part of the process. The agency hosted five public information meetings in late July 2016 to share information on specific proposals, which took effect in October. METRO hosted the following five meetings in July 2016 to inform and listen to members of the public regarding the proposed 2016 annual service enhancements. All 26 bus routes (22 local fixed routes and four express routes) received a thorough review and assessment. Because the service enhancements are low- or no-cost proposals, improvements could not be made to every route, as some opportunities/suggested enhancements that would dramatically improve service along certain routes would require additional funding, which is not available at this time. You may read through all of the route assessments below by clicking on the respective route names. Public comments, including those from bus drivers, community members, businesses, elected officials and riders were taken into consideration at the review’s onset and continued to influence the proposals throughout the process. Advances in technology also played a role: Whereas service mile route configurations were once calculated manually, the agency was able to use transit planning software to make more precise calculations to create proposed route changes, taking into account jurisdiction boundaries, which change on an irregular basis. Automated passenger counters, which were placed on each fixed-route bus in the system in 2015, provided more accurate data as to how many riders are boarding and alighting at each bus stop in the 1,600-stop system. Field work performed by METRO staff members yielded information on trip generators (places to which riders travel), rider behavior patterns (such as when riders are traveling and why: work and school commutes, travel to health appointments, grocery stores, etc.) and factors that could affect proposed route schedule times (at-grade railroad crossings, school car rider lines, etc.). During June and July 2016, METRO staff prepped public information materials for each proposed change, including information on related changes that pertain to schedules, bus stops and fares. Once the public information meetings passed, the agency hosted a 30-day public comment period, followed by a decision on whether to implement the proposed changes by the METRO Board of Directors. The enhancements, unanimously approved with the exception of the proposal to move service from Dixie and Sam Evans to Broadway, were implemented in October. Approved Enhancement: Add service to Donovan Briley, on the north part of the route, where many multi-family housing properties exist, during peak hours. This enhancement was a MOVE Central Arkansas (MCA) plan recommendation and was among the top three route-related service requests collected from riders in May 2016. In addition, Rock Region METRO recently received a petition with 124 signatures for this service. With this proposal, the off-peak route would remain as it exists currently. Approved Enhancement: Modify Route 8 to serve the Midtown transfer stop (behind Target) on all trips. Move service from low-ridership stops along Lee Avenue to the more in-demand Markham corridor, supplementing existing service along Route 5 West Markham. (Route 5 West Markham does not travel along Markham between Kavanaugh and UAMS; moving this service on Route 8 provides a bus along Markham, serving Capitol View-Stifft Station and Hillcrest residents and strengthening frequency of bus service along Markham, a key corridor of development in the MCA plan.) Both of these first two adjustments are recommended in the MCA plan. Extend route to Napa Valley Drive instead of Green Mountain Drive and serve area near Terry Library, Pulaski Academy and multi-family housing on Hinson. Approved Enhancement: Modify the loop at the end of the route to improve efficiencies and avoid unproductive stops. The change allows direct service to the Little Rock School District Adult Education Center at 4800 W. 26th St.
Approved Enhancement: The proposed change to Route 18 McAlmont moves service from Ben to Edmonds to improve efficiencies and avoid unproductive stops, as recommended in the MOVE Central Arkansas plan. centric destinations along one route. Approved Enhancement: Route 21 serves primarily two groups of riders: Riders traveling from the Riverdale area to downtown and riders traveling to UALR. Route 21 would be split into two routes: One route would serve the Riverdale area, including multi-family housing along Riverfront and Rebsamen Park Road, and would be interlined with Route 12. Another route would serve the University Avenue corridor. 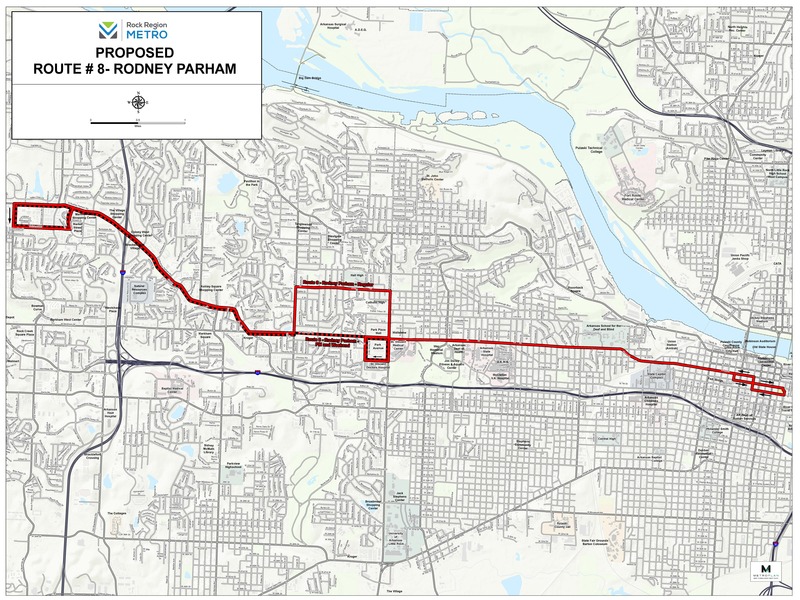 Approved Enhancement: The current airport route, Route 20, would then use city streets (as opposed to the highway, which lengthens the commute time) to serve Hanger Hill, the Little Rock Port Authority and other areas east of I-30, but not the airport (which would now be served by Route 12). Approved Enhancement: Modify Route 9 to serve the new West Central Community Center, add service to the loop inside The Cottages, add service to the Shackleford Walmart (providing a new “one-seat ride” benefit to a major shopping center) and remove an unproductive portion of service on Colonel Glenn. The portion of route through the downtown and midtown area would be rerouted from Markham to 12th Street. The connection to the Shackleford Walmart meets the “strong southern anchor” recommendation for Route 9 outlined in the MCA plan. 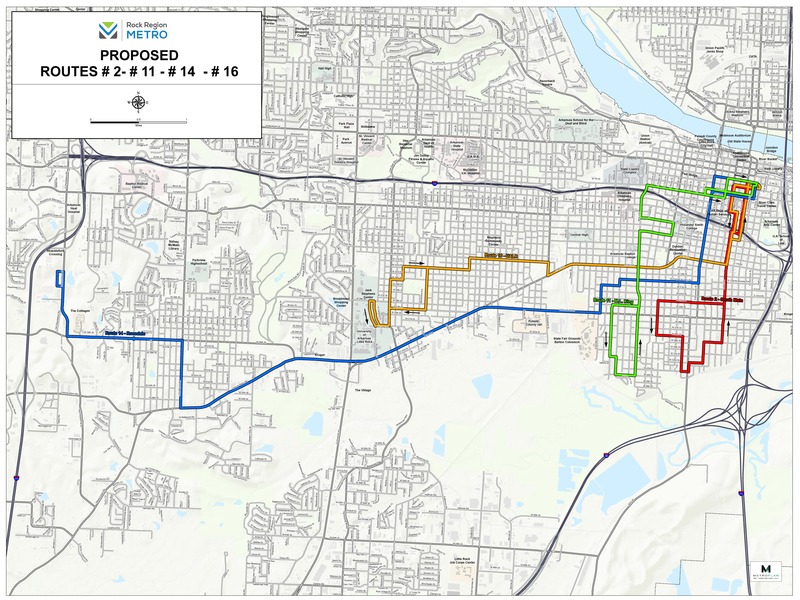 The proposed re-routing along 12th Street meets the focus of the development of 12th Street as a major transit corridor, also per the MCA plan. Approved Enhancement: Remove service inside The Cottages’ loop at the request of The Cottages, which does not have roads built to support large buses. Frequent service inside the loop is causing damage to The Cottages’ infrastructure. Approved Enhancement: Route 17 Mabelvale-Downtown and Route 22 Mabelvale-Midtown are complementary routes that operate at different times of the day. (Route 17 tends to serve riders commuting to and from work sites in the morning and evening, and Route 22 tends to serve riders who are making daytime errands such as health appointments, grocery-shopping, etc.) Move service from the Meadowcliff neighborhood to Mabelvale Pike, which can better accommodate buses. Remove the loop at the end of Route 17 (which will be served by Route 22 modifications) to provide service directly to Walmart on Baseline Road, which would speed up service and make the route operating more like a morning express service. Approved Enhancement: Switch current service on Route 22 from off-peak service to all-day service and provide service every 35 minutes. Replace service in the Wakefield neighborhood currently served by Route 15. Provide service on University Avenue to Kavanaugh in the Heights and continue to serve Baseline Walmart, which offers Wakefield residents a one-seat ride to Walmart – a new benefit to those residents using the transit system. 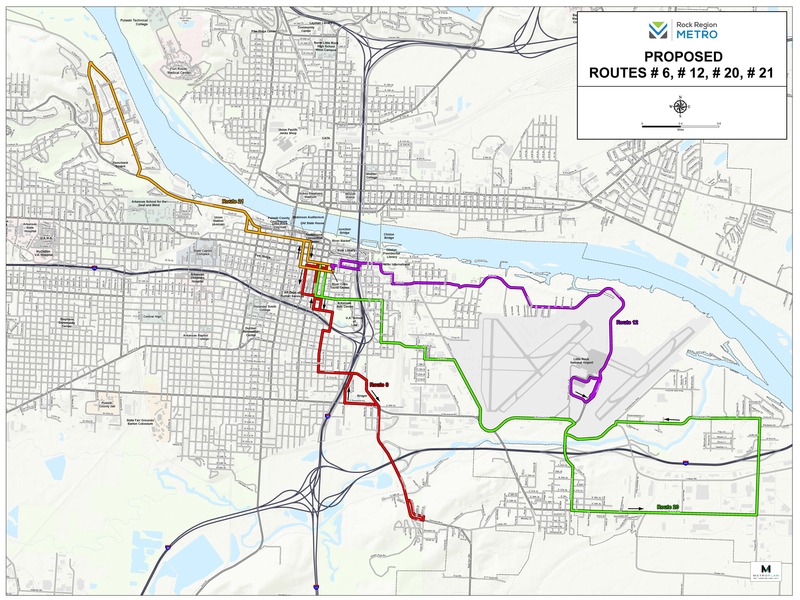 With these changes, Route 22 would be the first METRO route in the last 20 or so years to not have at least one termination point at the River Cities Travel Center or the Midtown transfer hub. Approved Enhancement: Remove the second loop into the Outlets of Little Rock, leaving the outbound (from downtown LR) loop only to cut down on travel time. Add a loop into the Goodwill Industries of Arkansas campus at Scott Hamilton, which serves individuals with disabilities and is currently being served by Route 15. Add a bus (gained from Route 15) to improve headways during peak travel times. Approved Enhancement: Route 15 primarily serves two neighbors very far from each other. The proposed change captures the productive areas of Route 15 and reallocates service to those areas along other routes. The central portion of the existing route is served by plans for Routes 2, 11, 14 and 16, and the southern portion of the route can be served with the proposed changes to Route 22 Mabelvale-Midtown. 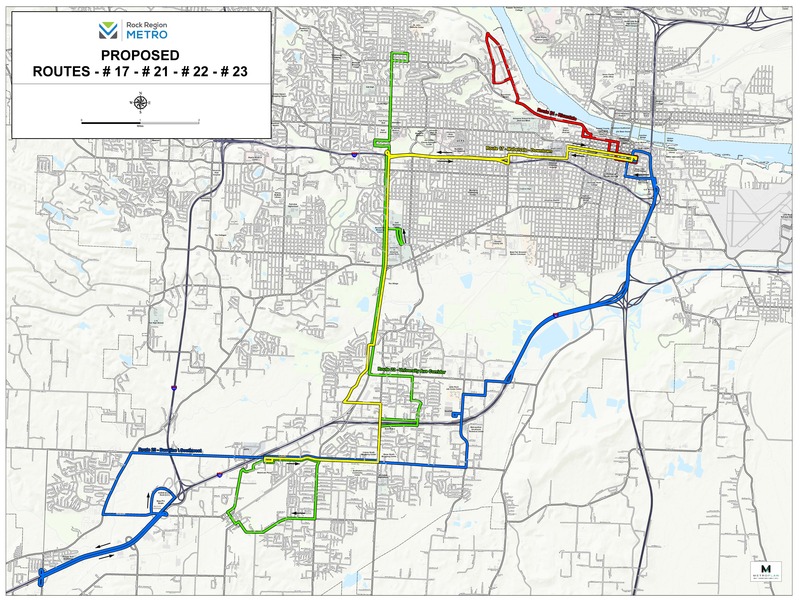 The proposed change would remove Route 15 and reallocate service to other routes serving the area, which is a MOVE Central Arkansas plan recommendation for this route. Route 11 Dr. M.L.K. Jr. Dr.
Approved Enhancement: The proposed change to Route 11 Dr. M.L.K. Jr. Drive modifies the route to provide service to Chester Street (serving Philander Smith College). This change accommodates proposed changes to Route 15. Routes 6 and 26 received minor schedule adjustments and new schedule brochures. The Route 6 schedule was adjusted to improve the overall schedule, with no time added or removed from the route run time. The two morning buses from Maumelle to downtown Little Rock now leave 10 minutes earlier to accommodate more transfer opportunities to other routes. Without adding a second line of rail to the Main Street Bridge, there is no way to add more streetcars to the streetcar routes to speed up frequencies, although streetcars arrive more frequently at Little Rock stops because two streetcar lines operate in Little Rock (the Green and Blue Lines), as opposed to one line operating in North Little Rock (the Blue Line). Approved Enhancement: Shift streetcar Sunday service back one hour to better accommodate the downtown attractions, which often open at noon on Sundays (current Sunday streetcar service begins at 10:41 a.m.). Approved Enhancement: Adopt a bus stop policy that requires all passengers to board or alight buses at bus stop signs. The benefits of a bus stop policy include more efficient travel times and improved data quality from the intelligent transportation system by reducing the number of “unknown” stops. This data is used to help plan future transit service. Beginning Monday, Nov. 14, 2016 METRO’s new bus stop policy went into effect. This policy requires all passengers to board or alight buses at bus stop signs. The only exceptions to this policy will be express routes and passengers with disabilities using an accessible bus stop flag. Proposed Enhancements: Establish a fare policy that outlines the agency’s responsibilities and philosophies, sets a farebox recovery rate goal for each service, defines fare adjustments, defines fare discounts and confirms the public participation process in relation to fares. Remove multi-passes for streetcar that haven’t been used heavily (primarily because of the nature of streetcar trips, which are taken by visitors to Little Rock and Arkansas and locals, who tend to use the streetcar on good-weather days and for events), including the 3-day pass and the 20-ride pass. Research fare payment options (vending machines with debit and credit card options for streetcar passes, mobile payment options for streetcar and bus). Allows riders automatic review of scheduled trips and ability to cancel scheduled trips via an automated phone menu. The IVR system will send a robocall to METRO Links passengers five minutes ahead of their scheduled pickup, based on GPS technology. This technology allows riders to reach a live reservationist more quickly. The IVR system was slated to be implemented in 2017. METRO received two new METRO Links paratransit vehicles, AMG MV-1s, in 2016. The MV-1s can accommodate up to two persons using wheelchairs, as well as up to two or three ambulatory riders, depending on the ride configuration. METRO Links also debuted eight new Starcraft vans, four 23-foot vans and four 25-foot vans, in 2016. The vans can accommodate up to six persons using wheelchairs (eight for the larger van) and up to 12 ambulatory riders (16 for the larger van), depending on the configuration. Having different vehicle sizes for paratransit service allows the agency to improve efficiency while serving riders. The new vehicles replace 10 7-year-old paratransit vehicles. The entire METRO Links fleet will be replaced by the end of 2017. Bookmark rrmetro.org, sign up for our enewsletter at the bottom of this page, follow @rrmetro on Facebook and Twitter, email us using the contact form below, call us at 501-375-6717 and mail us at the administration address below.